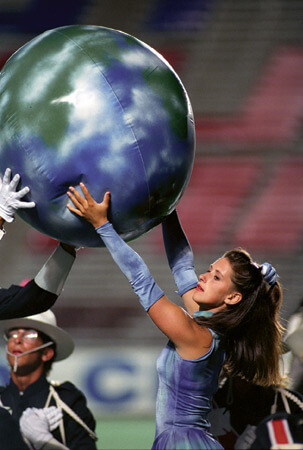 DCI.org columnist Michael Boo wrote these program notes about the Crossmen's 1992 eco-themed production for the 2006 edition of Drum Corps International's popular movie theater event, "The Countdown." Never before had a corps so successfully embarked on a three-year voyage through a single thematic idea. With "Songs for the Planet Earth," Crossmen's song cycle commenced by visiting our home planet, placing the corps in the top half of finalist corps for the first time in its history. The show preached concern for the environment without being preachy. Watch how the horns started scattered through space and then traveled on a curved path through the solar system. "The Four Elements," an original work by staff member Matt Krepansky, provided the guard with an opportunity to try to "tie things together" with some intriguing fabric visuals. After the joyous jungle colors of creatures in "The Rain Forest," the show tapered to silence as the planet moved on its way through the galaxy, ending with a large, literal question mark that left the future hanging in the balance, asking us what we were going to do to change the final form to an exclamation mark.